Who is Virginia Lt. Gov. Justin Fairfax? As calls grew louder for Virginia Gov. Ralph Northam to resign over racist photos on his medical school yearbook page, waiting in the wings to succeed him if need be was Lt. Gov. Justin Fairfax, a descendant of slaves who has protested the state's honoring of Confederate leaders. But in the coming days, Fairfax would be buffeted by calls for his resignation as well. Two women have come forward alleging that he sexually assaulted them. Vanessa Tyson, an associate professor of politics at Scripps College in California, claimed that the then 25-year-old Fairfax sexually assaulted her in a hotel room during the 2004 Democratic National Convention in Boston. Fairfax vehemently denied the claim. Through a statement released by her attorney days later, a second woman, Meredith Watson, claimed that Fairfax raped her while the two were students at Duke University in 2000. Shortly afterward, Fairfax issued a statement denying what he called the “latest unsubstantiated allegation." By the following weekend, most of the presumptive Democratic nominees for president in 2020 had issued strongly-worded statements calling for Fairfax to resign, including Kirsten Gillibrand, Elizabeth Warren, Amy Klobuchar, Kamala Harris, Bernie Sanders, and Cory Booker. Former Vice President Joe Biden, who had earlier called for Northam's resignation and for Fairfax to lead Virginia, has not weighed in publicly. Virginia House Delegate Patrick Hope made efforts to introduce articles of impeachment if Fairfax did not resign over the weekend after the claims were made – though he later backed down after conversations with others in the House, he said. Fairfax continues to defy the pressure to resign from most leading state and national Democrats, instead calling on the FBI to investigate the claims and vindicate him. 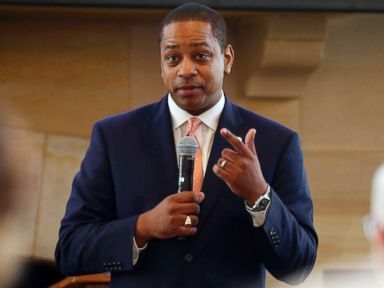 Fairfax, 39, an Ivy League-educated lawyer and former federal prosecutor, was elected lieutenant governor in 2017, becoming the first African-American in nearly 30 years to win a statewide office. 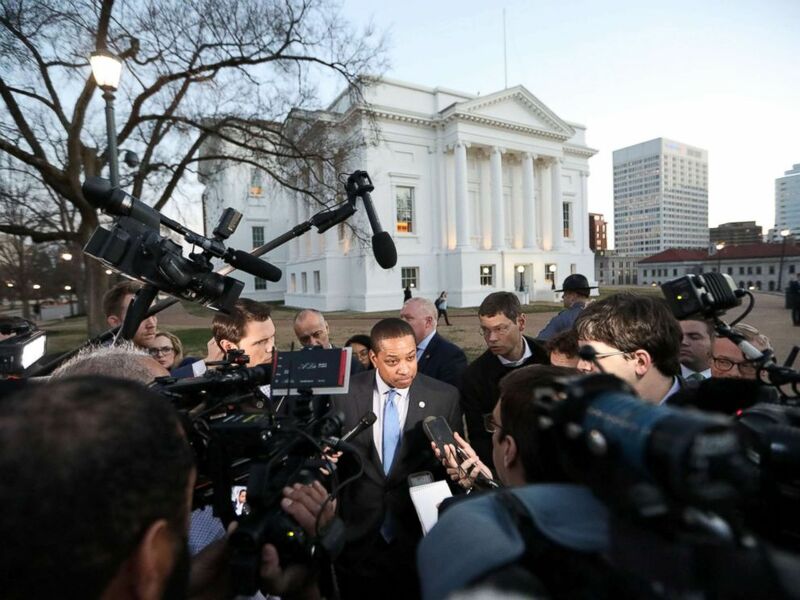 Virginia Lieutenant Governor Justin Fairfax addresses the media about a sexual assualt allegation from 2004 outside of the capital building in dowtown Richmond, Feb. 4, 2019. 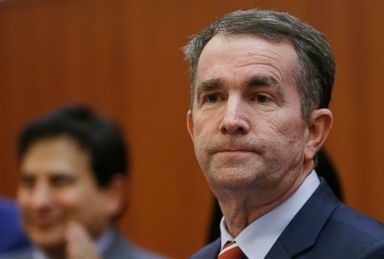 The controversy in the Commonwealth began in early February when a photo of a man wearing blackface and posing next to someone in a Ku Klux Klan garb surfaced in a 1984 yearbook from Eastern Virginia Medical School, under a page emblazoned with the name "Ralph Shearer Northam" at the top and including other pictures of the future governor. By Friday evening, Northam apologized and confirmed he was one of the two men in the racist photo on his page. But on Saturday, the governor retracted his statement, saying he was actually neither man in the photo. Virginia Gov. Ralph Northam prepares to address a news conference at the Capitol in Richmond, Va., Jan. 31, 2019. Northam also compounded his problems by revealing that in the 1980s he participated in a dance contest dressed as Michael Jackson and even wore black shoe polish on his face and learned to "moonwalk" like the late King of Pop. Northam, 59, a physician, has so far rejected calls from Democratic leaders, including former Vice President Joe Biden, to resign. State Attorney General Mark Herring also dropped another political bombshell in the midst of chaos in the state, revealing in a statement that in 1980 he dressed up as rapper Kurtis Blow and wore "brown makeup," to a college party. In a statement about the controversy, Fairfax said he was "shocked and saddened by the images" on Northam's yearbook page. "They are an example of a painful scourge that continues to haunt us today and holds us back from the progress we need to make," Fairfax said in his statement. "As we commemorate 400 years since the first enslaved Africans were brought to Virginia, it is painful to experience such a searing reminder of the modern legacy of our nation's original sin," Fairfax said. "And, as someone whose great-great-great grandfather was enslaved in Virginia, this episode strikes particularly close to home." Days later, the allegations of assault against Fairfax surfaced. Fairfax, a married father of two young children, grew up in Washington, D.C., and attended Duke University on a scholarship. After graduating in 2000 with a degree in public policy, according to his bio on the lieutenant governor's website, he began working in politics. Fairfax worked on Al Gore's presidential campaign before enrolling at Columbia University School of Law. Upon receiving his law degree, Fairfax served as a law clerk to Judge Gerald Bruce Lee of the U.S. District Court for the Eastern District of Virginia. He later landed a position as a federal prosecutor in Alexandria, Virginia, serving as deputy coordinator of the Northern Virginia Human Trafficking Task Force, according to his bio. During his run for lieutenant governor in 2017, he garnered a key endorsement from former President Barack Obama. ABC News' John Verhovek contributed to this report.